Cruise the streets of Hominy, where 40 murals have been painted on the sides of city buildings. Most are the work of Hominy native, Blackfoot artist Cha' Tullis. Meet Tullis at Cha' Tullis Designs, a gallery where he sells jewelry, painted clothing and other art. You can pick up a map of the murals at the visitors information center at a restored MKT Depot on Main Street. Don't miss "New Territory" sculpture - twenty-foot steel images top a hill on the west side of town. Try the burgers at the Silver Dollar Cafe in the same building. Hominy was named for the Osage chief Ho-Mo-I, which translates to Walks in the Night, and was first home to one of the tribe's three main groups. The Osage traditionally held dances in structures called roundhouses; the 1919 Osage Roundhouse west of town is the last in the county. For a look and grand old Hominy, visit the 1905 Victorian-style Drummond Home, built by merchant Fred Drummond. Drummond's descendants left the house and its contents to the Oklahoma Historical Society. E.W. Marland's oil empire was just one county away, where a Marland Oil Co. Station (c. 1925) has been restored and holds oil company memorabilia. Also in Hominy is Shady Brook, the 1903 Victorian home of prominent local doctor J.J. Fariley, and a 1904 sandstone schoolhouse, the Little Stone School. Ten miles west of town is the White hair Memorial, the former home of the first woman to be nominated to the Osage Tribal Council and a descendant of Chief Pawhuska. Ribbonwork and other cultural items are on display. The hills and prairies of what is now Osage County were the ancient hunting grounds of the Osage people. In 1872, following several forced moves from their old lands in Missouri, the Osage moved to their "last reservation" - their old hunting ground. The Osage looked forward to being undisturbed in the rock limestone country, land that was hostile to the plow. But it was a land rich in grass and underlain by great pools of oil. The Osage, however, were never to find the peace and independence they sought. After years of resistance, the Reservation was allotted in 1906, and in 1907, with Oklahoma's statehood, the Osage Reservation became Osage County. The white man came to the Osage Reservation in 1872. One of the three principal trading posts operating on the Reservation was Hominy Post, founded in 1886. In 1903, the Missouri-Kansas-Texas Railroad came to the Reservation. A key stop on that line was the little trading village of Hominy Post. After allotment, the oil boom that would transform Hominy Post into the city of Hominy began, lasting throughout the teens and 20s until the crash of the Great Depress;ion. For decades, Hominy was a bustling center of trade, ranching and oil. At the height of its prosperity, Hominy's population reached 5,000. Wide brick streets lined with attractive homes, substantial business buildings on Main Street, and proud and optimistic citizens characterized Hominy in the middle 20s. In the last 50 years, Osage County economy has been one boom and bust in the oil and cattle industries. In the coming years Hominy looks ahead to attracting new industries, manufacturing and tourism. 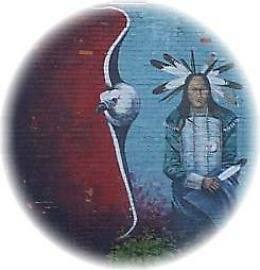 Artist Cha' Tullis, a Blackfoot Indian, began painting giant murals in Hominy in April 1990. Along with other local artists, 40 and more spectacular murals depict Indian folklore and are a delight to behold, located on various buildings throughout town. Constructed in 1907, the building has always served the community as a drug store. Its affiliation with Rexall dates to the 1920s. The second floor was used for many years by various professions including law, dentistry, and photography. Built in 1919 to replace an earlier roundhouse, it is the only surviving community round house in Osage County. Traditionally the focus for village activities, it has been used for dances, gatherings, and meetings and is a symbol of tribal unity and tradition to the Osage Indians. Hominy's 1921 Marland service station is one of the few surviving examples of the popular triangle design utilized by the old Marland Oil Company (now Conoco). The building is under restoration by the Hominy Heritage Association. This Osage center features a collection of Lillie Morrell Burkheart. It is the former home of the first woman to be nominated to the Osage Tribal Council and a descendant of Chief Pawhuska. Ribbonwork and other cultural items are on display.